I love Double Commander (DC) as a two-pane file manager and have already written about its basic features, how to add 7z support and some svn woes. But DC has got some advanced features which you maybe wouldn’t expect. Under Files-Multi Rename it has got a tool with which you can do a rule-based rename of many files easily. Very useful e.g. to rename songs downloaded from Amazon. Under Files-Compare by Content you’ll find a diff tool. But you could also configure DC to use the diff tool you prefer. One of the panes then will show the entries FTP and Network. Double-click on FTP, then it will show Add connection and Quick connection. Double click one of them to add a connection. DC is extremely configurable and extensible. Some examples. Select an internal command from the combobox or create an external command. You can use anything you want as a command and you can pass parameters like the currently selected file or path to it. Add a tooltip, icon and hotkey as you like. You can connect file extensions with commands and hotkeys. For example, I as a software developer often need to know the version of a certain dll. Open Options dialog, select node File associations. Under File types select Add and add file type dll. Under Extensions select Add and type in dll. Under Actions select Add and then click the + and select View. This relates to the View command or cm_View in the DC. Now, when a dll is highlighted and I hit F3, its complete version info is shown. Much easier and faster than right-click-properties-details. For Windows 7, 8 and 10 you can use the built-in Resource Monitor for this. Open Resource Monitor, which can be found by searching for resmon.exe in the start menu, or as a button on the Performance tab in your Task Manager. pointed at by blue arrow in screen shot below. In case it’s not obvious, when you’ve found the handle, you can identify the process by looking at the Image and/or PID column. You can then close the application if you are able to do that, or just right-click the row and you’ll get the option of killing the process right there. Easy peasy! Remark: The complete text and the picture above are taken from one of the answers to the question on superuser.com. Some of the comments there claim that sometimes they could not find handles with Resmon but could find them with Process Explorer. 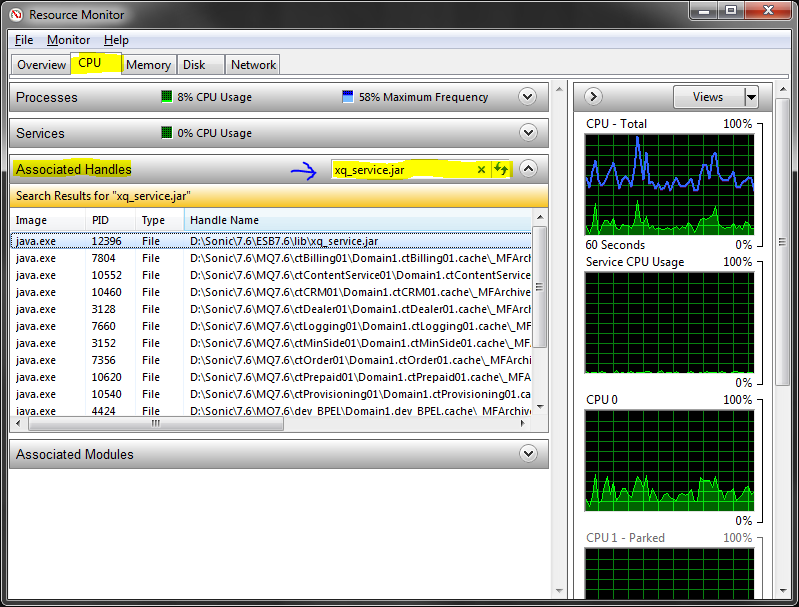 Some others claim they could not find handles with Process Explorer but with Resmon. * You cannot use slashes instead of backslashes. With these two bash commands, you can recursively delete all files older than 5 days and after that all now empty directories. I use these commands to clean up temp directories. In the first line -mtime +5 finds all files that are older than 5 days. The + sign is important. Without it, only those being exactly 5 days (5 * 86400 seconds) old would be found. In the second line -depth makes that child directories are treated before parents. That is important here. Otherwise a directory a which contained only an empty directory b would not be deleted. rmdir only deletes empty directories. For that you don’t see rmdir's griping about non-empty ones, the 2>/dev/null is used.